Home » Business » 20+ Smallholding Business Ideas Worth Trying! 20+ Smallholding Business Ideas Worth Trying! Are you are just starting out in smallholdings? Or, are you an existing owner in need of engineering some new revenue streams? Is your investment facing 'make or break'? Are you falling short at running a smallholding for profit? Then you might be in need of a few innovative smallholding business ideas. Trawling the internet hoping to be stirred by your findings gleaned from one website (or blog) to another can be a little hit and miss. Hence why we dutifully compiled this shortlist of business ideas with smallholders in mind. We hope it saves you time and preserves your patience whilst researching ways to make your smallholding pay off. 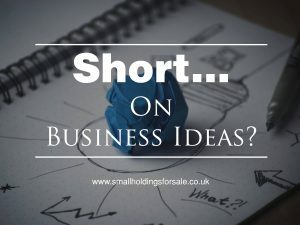 What to do when you are short of business ideas for your smallholding? The definitive features of a smallholding do lend themselves to being useful bases for running all kinds of business models. By nature they possess characteristics which could be advantageous for operating a number of brick and mortar, or even digital-based enterprises. Private land...and how to make a profit from it! ...being apart from public concourse, such areas of real estate as smallholdings provide for a more secluded backdrop for endeavours requiring tranquillity or separation. Multiple outbuildings...ideal for starting a smallholding business! ...the utility of a site with multiple buildings affords a segmented approach for ring-fencing your choice portfolio of operational activities, in complete isolation, should you wish. ...constraints with space can inhibit your ability to fulfil more expansive business plans. A smallholding gives the liberty of space for large scale operations both inside and outside. Diversify your smallholding...ways to enhance a farmers salary! ...smallholdings, because their rural situation are complimented with many naturally occurring benefits for running all sorts of enterprises. Such features are: open water, multi-purpose fields, woodlands etc. Room for many onsite amenities...how to earn money from vacant land! ...due to the luxury of space, smallholdings can accommodate many types and iterations of layout. Large complex pieces of equipment can be stationed on the land either temporarily, or permanently with relative ease. 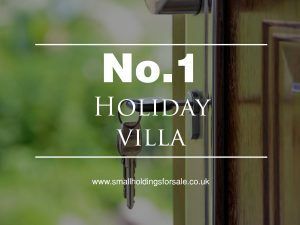 A holiday villa or cottage is an investment which for most smallholdings owners seeking to make their real estate investment return a residual income, year-on-year. Albeit heavily influenced by seasonal demand, this business idea can generate cumulative benefits in repeat bookings and recommendations to keep your enterprise afloat. Capital expenditure will be needed in order to set-up or perhaps even renovate the fabric of the building and to stock it according to the needs of your guests. Strong branding and marketing presence on & offline will keep the business on the map and top of mind for all those prospective guests who are seeking a destination holiday in your vicinity. Cleaning and turnaround after guest's stay will be of paramount importance to your business model, especially when booked back-to-back during business periods. 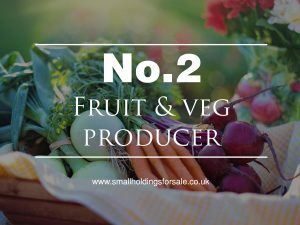 Production of locally grown produce is increasing in popularity for a number for reasons, most notably in the rousing of support by communities for their local farm producers. Chefs and restaurants often look for local producers with whom they partner with on a market garden basis offering niche supply of choice ingredients, for popular/regular recipes. Consistency is key. Quality of product and of service. These aspects keep the relationships with buyers buoyant and give confidence for further trial purchases. There is a possibility for this kind of business to be highly affected by the seasonality of vegetable growing. But there are some year round income opportunities if you are able to grow certain hardy types. Farmer's markets are another source of potential custom for local producers. But not without an investment of course, in order to book a gazebo at your local market you'll need a revenue budget. Grazing land is often an inclusion for most smallholdings owners. Holding livestock on the land and running a dairy business is a means of making your agricultural investment accrue gains over the long term. Aside from the relevant licenses and registrations, keeping the herd of cows healthy, contented and continually fed & milked ensures your dairy production will be without depletion and running optimally. Finding co-operative marketing arrangements with industrial buyers yields ownership to 3rd parties, however independent arrangements with local or regional buyers can keep sovereignty. Raw milk is an increasing trend which many consumers are finding a favourable alternative to pasteurized milk products - particularly for health reasons: notably cholesterol benefits. Marketing your dairy products, to the local marketplace to establish a successful milk round is another revenue generating angle for your independent diary. There are cash flow risks associated with running a milk round - one such notorious impediment is the collection of payment. Whilst sales revenue is typically healthily split across many accounts - not concentrating earnings in any one particular arrangement or cluster - it still can be problematic to successfully gather 'monies owing' from such a fragmented customer base. One advantage of a milk round is the year round income it produces, not being restricted only to summer months. This is a licensed business which is regulated by the local authorities, giving the provision of a boarding facility for dogs whose owners for a temporary period are unable to accommodate their pets. Such a reason could be a family holiday, where taking the dog is either impossible or would be highly problematic. Sufficient outbuildings would need to be acquired or built on the smallholding in order to accommodate your host pets. 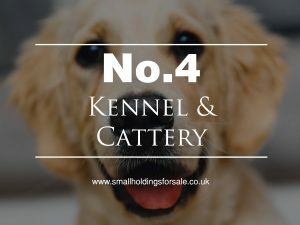 Dogs and cats are very particular in their temperament and be heavily affected by their environment and handling, thus a low risk kennel and cattery operation must have experience. Catering to the individual needs of your animal guests can leave an inexperienced handler out of their depth and facing collateral damages. The greatest business asset in this type of endeavour will be highly experienced animal husbandry experts on hand to tackle the day to day management of pets. Due to the seasonal nature of demand i.e. mainly in the summer when owners and their families travel abroad for vacations, smoothing out income throughout the remainder of the year may be a challenge. Diversification of earnings is advised, no matter the plan. Formally presented nature trails led by a genuine expert of the outdoors can be a great day out for people of all ages. The location of a smallholding, if situated in a unique enough position, can be just the backdrop to set off a successful nature trail enterprise. Offering some complimentary hospitality services like board and perhaps a kitchen/canteen serving meals at set times a la traditional bed and breakfast would give your guest the full circle 360 hospitality experience. Of course a well planned and documented traverse of the local landscape would need to be considered well in advance, with right of way or possible trespass, potential hazards and risks along the way. Depending on the types of guests you attract particularly with age and capability in mind, you will have to set out clear policy for responsibility and liability communicated well advance of bookings being taken to avoid disappointment. Acquiring the services of a competent and affable tour guide to lead those who prefer the fully managed delivery of service, will be a worthwhile investment for the long term. Group bookings might grant the ability to financially forward plan, with greater certainty. But if such arrangements fall through, large quotas of your planned financial income can vanish instantly, leaving your plans for financial provision falling short. Solid branding and marketing collateral - with a hearty sharing of your expertise online via social media channels can go a long way to generating promotion for your business. 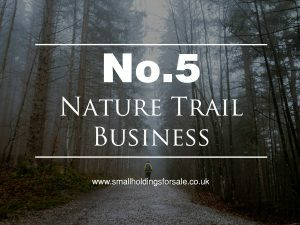 A website with e-commerce integrated bookings calendar would enable 24hr bookings availability using digital automation techniques, giving you liberty to spend more time hands on in the more mission critical operational running of your nature trails. An adventure centre is a more ambitious undertaking. With the diversity of planned and ad-hoc activities, each having it's own focus on your grounds and it's team for fulfilling the occupation of guests - this kind of investment requires significant manpower even just to manage the administration, let alone the operations. However, for the right investor this kind of venture could grant significant business earnings, built on solid customer experiences and therefore brand reputation. Multi-disciplinary staffing is a major quality related factor on service delivery. Job satisfaction of staff then becomes a a high dependency business issue. Retention of talent could make or break such a venture. Health and safety alongside risk management across the board is a continual work. It needs diligent governance to stay within the margins of regulations and best practices and standards. Named and nominated risk officers should preside over the individual components of activity categories. Meticulous documentation of reviews, assessments and checks is required to demonstrate competency to continue running such an operation. A staple request for many a mid-level to high end professional services firm. Keeping team morale high in fast paced, office-based corporate world sometimes calls for letting off some steam in the outdoors, reshuffling roles and responsibility and getting stuck into some practically challenging activities, the success of which relies on...you've guessed it, 'team work'. As such outings can be more than one day in duration you will need to account for all the customary hospitality that comes along with hosting guests. Businesses with large head count can request an all-in attendance for such an activity spree, giving you the logistical challenge of readying yourself and your smallholding for receiving perhaps 150+ guest parties in one go. 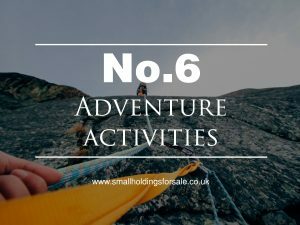 As with an adventure based venue, having the quantity and quality of event marshals on hand to steward the activities for customers is mission critical. 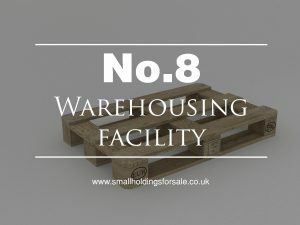 Storage facilities on-site for holding and preparing kit for use is also a necessary amenity to have. Your smallholding will need to have this. Client relationship management is important for retaining repeat business. This done well will pay you back in high margin profits gained from business already in hand. Many high volume retail businesses are in need of warehouse sq.footage from which to dispatch their order by courier to customers. 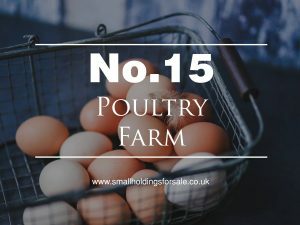 The rural nature of smallholdings isn't a disadvantage for such businesses, as the customer facing end of their operation need not openly connect to your smallholding address. 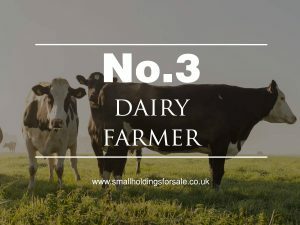 This would leave your smallholding free from corporate client visits, but very much used as a daily hub as a logistical launchpad in fulfilling a high volume sales businesses. E-commerce businesses who leverage the internet, in particular Google search engine to generate high volume sales are now more commonly outsourcing their order fulfilment to 3rd parties with the combination of space and functional warehousing capability. You would need outstanding building security and integrity to keep safe the valuable stock of your clients. Insurance too to cover the operations of this business. Capital equipment such as forklift trucks as well as qualified operators and health and safety training for all relevant staff members are ongoing revenue costs for keeping this type of business going. Many a business operating out of your region and experiencing logistical growth challenges may well be looking for a smallholding with the space and 'lock-up' potential of your plot. 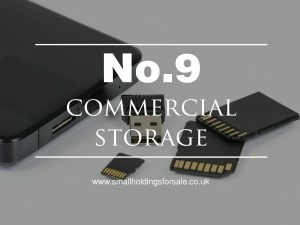 With the right investment into developing a secure commercial grade storage facility, and some staff on ground to man the holding and processing of goods, a storage business might be feasible. Such a potential customer might be a regional marquee hire firm which is expanding and has outgrown their current operational facility. They may well see your smallholding storage offer as an ideal bolt-on for the short/medium term - especially if offered an attractive price. Another local authority licensed business idea for smallholdings is running a registered campsite. Whilst there are some license exemption criteria, generally speaking if your plans don't fall within one of the caveated exceptions to the rule, then you will need to apply for a license to operate. 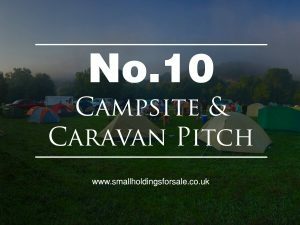 Whilst there are many camping, caravan and motorhome routes thorough the UK countryside, travellers often want at their finger tips options for where to pitch-up comfortably. Emphasis on the 'comfortably'! Amenities such as outdoor toilets, stand pipes for running water, outdoor showers etc are all necessary provisions for such an endeavour. If you go the extra and provide laundry facilities, you might attract a majority of visitors to your site even if you are new to the business. Word will get around on the circuit, often via informal message boards and forums on the internet where one user will refer your site on to another. A determined socially active strategy online will get your campsite before the faces of many a prospective customer. Avid fishing enthusiasts enjoy finding a secluded spot with all the right amounts of tranquillity, a well stocked lake and some simple on-site amenities. 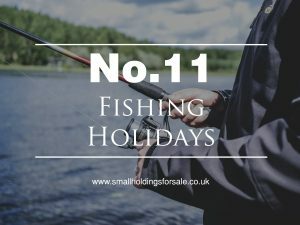 If your smallholding is near the lakes in Cumbria, for example, organising fishing holidays could well be a good little earner for you and the family. Private visits as well as guided outings could occupy your land throughout the year - giving guests the liberty of choosing how much involvement they would want you to have during their aquatic getaway. 1-to-1 fishing training by an experienced, expert trainer is a solid match for many a corporate executive seeking after a remote getaway. Running an apiary or beekeeping is a preferred side business for many a smallholder. Whilst quite a technical discipline and a high maintenance one, as the hive need lots of attention for the telltale signs of distress etc. 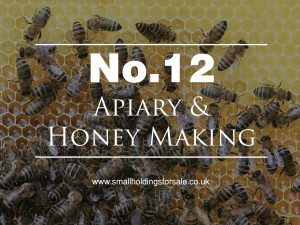 before major trouble and therefore losses set in, a simple apiary can be set-up with relative low investment. Honey, honeycomb and wax are the main/popular products when running an apiary. Local honey finds itself entering into the food chain typically at farmers markets, however direct sales to specialist retailers as well as internet sales makes for greater audience reach. 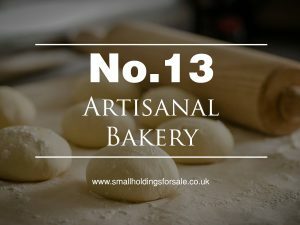 An artisanal bakery is a good possibility for a smallholding to run for profit. A wood-fired stone oven gives for a more authentically rustic flavour and result of product. With a large enough facility you could produce enough product to service regular business and consumer clients. Clearly, the culinary expertise is a most necessary prerequisite and of course a local council license to sell catered products. A local/regional delivery round is a solid way to build a customer base and secure some ongoing business income. Available grounds for a marquee event in rural locations is fast becoming a go-to reach for many event manager, thus making it an attractive proposition for smallholdings owners. From the off, the warning here is yet again the seasonality of this business idea. Popularity of outdoor events in the UK is predominantly governed by the climate, thus spring/summer is about the only time where such events take place. This leaves the remaining months barren for business, unless you have other ventures of course! 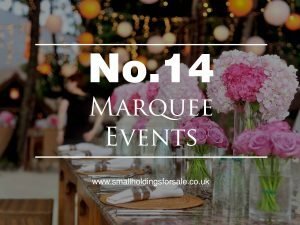 You could go all the way to purchasing your own marquee structures and accessories - offering a turnkey outdoor event solution to the likes of wedding planner and corporate event organisers alike. Marquees require a lot of man power to erect and so having the reliable help on hand to perform the build and take down is essential to keeping your operation up and running. Finding a profitable way to occupy rigging staff during the seasonal downtime will work in your favour with talent retention. Clean, dry storage for holding stock is important for avoiding mildew and mould spores tarnishing covers. Keeping laying hens onsite within your smallholding is great way to earn some residual income. They are pretty low maintenance and you can keep and many as 49 hens on your plot for commercial purposes in the UK (accurate as of 10-10-2017) without applying for a CPH license. This gives you a good head start on production and trade, before undertaking further administrative overhead. Some well constructed chicken housing and the necessary feeding, watering and cleaning equipment and materials is needed for livestock upkeep. For broilers (hens which eventually are prepared for poultry meat), the grass fed variety are now gaining popularity in the chicken meat market as boosted by the emergence of a new organic food trend called, Pastured Poultry. The benefits proposed by eating pastured poultry are closely related to flavour and nutrition, including higher protein content. Among the more health conscious circles there is a premium attached to such birds. Local/regional communities often support local poultry producers. Restaurants & specialist retailers are also viable customers which will often offer repeat purchase to such producers. Establishing a mailing list, being active within rural community exchanges, using social media to gather together an audience for your products, strong branding and reliable delivery could be just what your poultry farm start-up needs to get off the ground. 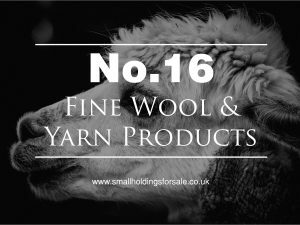 Sheep and alpaca fleecing are a good business choice for you if your smallholding has grazing land and you are experienced in animal husbandry. Managing your herds throughout the seasons takes expert handling to get right and prevent loss or injury. Establishing a close relationship with each member of your herd takes time and an intimacy in relationship that pays off in the long run with trust and obedience. Shearing the herd in the spring is when you expect to gain your yield on wool production. On site processing (washing, picking, carding, roving, spinning) for converting wool into yarn is investment heavy because of machinery and materials. Acquiring the necessary skills to make the yarn is also imperative. Niche branding and an e-commerce driven website design could be the start of your new fine premium product business. A restaurant is a high-risk, high investment option but one which, with the right combination of owner credentials, might just be a winning choice. Conversion of your smallholding with the installation of a fully functioning commercial grade kitchen is a capital intensive undertaking. It requires a great deal of planning and restaurant management expertise to get right. 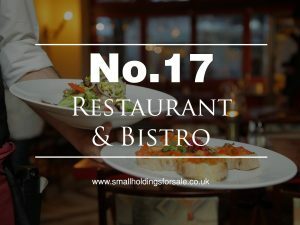 Employing the right grade of kitchen staff and most importantly chef talent to produce a menu to seal a signature style which your establishment shall be known for. A license, of course, is required to trade as a restaurant which your local authority will be responsible for issuing. - A bespoke suite of custom branded marketing collateral, including a well optimized website should get you firmly on the local map. Manure is a age old natural fertilizer which many have great need of, especially in the rural economy. If you have a herd, then collection of their waste, if processed appropriately for use as fertilizer could be another man's gold. Composting techniques, testing chemical composition, drying methodologies, bagging and transport are all core competencies for this business. Direct sales of your fertilizer product is a solid means of building a customer base. Perhaps target advanced local allotment participants and organisers, other independent farmers and avid gardeners. Social media is a great way to reach out to new potential users in this area of need. Specialist training facilities with accommodation could be the smallholding business idea you have been waiting for. Less intense than the adventure holiday schemes. Training centres are relatively personnel lite. 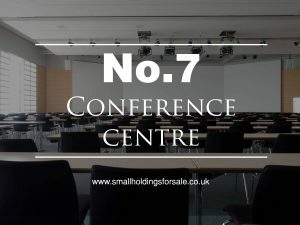 Once you have refurbished the interior to be fit for conference purposes, complete with some simple canteen, refreshments machines, toilet facilities and car parking provision, then the the general upkeep and management comes down to cleaning and preparation. Keeping equipment, like projectors or computer lab PAT tested, with most up-to-date software and in tip top condition is necessary for avoiding client disappointment. 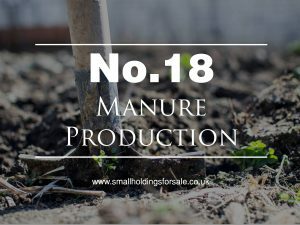 Liaising with regional trainers and consultants, especially in emerging technological fields...even health and safety professionals, or outdoor businesses like marquee hire contractors could use the advantageous mix of outdoor space with indoor amenities of a well laid out, multipurpose smallholding. Developing a sporting facility for exhibitions and competition could work for some smallholdings owners. An all-purpose facility for many sports, both indoor and outdoor - complete with pitches, courts, gymnasium and canteen for athletes could be just the resource your county is seeking to upgrade it's profile. High capital investment for equipment is required and ongoing maintenance to keep the resources available for use is required. Good quality sporting pitches, whether natural grass or artificial, like astroturf, are greatly sought after by most local sports teams as suitable venues to accommodate their sporting routine and events. Hosting tournaments onsite whether indoor or outdoor draws higher level publicity to your facilities and if all goes well, repeat bookings for the same tournaments a year on. 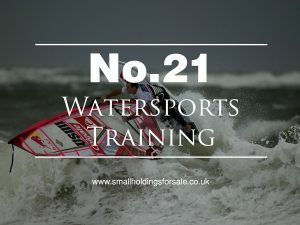 If your smallholding is neighbouring or has the asset of open water upon it's grounds, then commission ing some water sports activities may be a feasible idea. 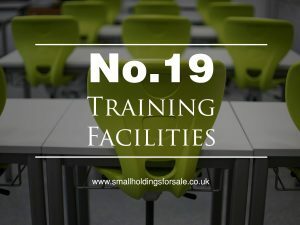 Employing trainers who are capable and experienced is a key to delivering the utmost quality and therefore growing in reputation within your niche. Keeping and maintaining boating stock in pristine condition is key to service availability remaining up. Liaising with local water sporting clubs will also be a good way of expanding the recognition of your business. 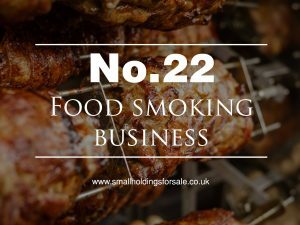 Smoking foodstuffs is an age old tradition among many cultures, but now in the mainstream it is a growing trend amongst modern foodies. Acquisition of capital equipment is fairly cost effective in the hundreds of pounds region for setting up a modest start-up operation. The expertise required to perform cold smoking can be picked up fairly simply, and is readily available via online teaching resources - also there are catering courses which are open to people of all levels of proficiency and experience, teaching the basics to intermediate skills. Niche food trends like smoking are attracting high price premiums on the food market as amateur chef culture takes off. Ready made smoked food products are relatively inexpensive to produce, given the initial expense paid of equipment and ingredients - the only further investment which is costly in another ways is - time, attention to detail and patience! Fairly labour lite, the cold smoking process can be done single-highhandedly without trouble. Drying and packaging of food products is another operation in itself - which calls for technical know-how, capital investment of mechanical equipment and labour to run. Foods preserved by smoking or curing perish much more slowly which is ideal for postal delivery. Branding and marketing for communicating the benefits of your products to consumers and trade buyers is a worthy focus, as the foundation you lay here will be what supports the cohesion of future campaigns in the marketplace. Made strong from the start, a bedrock of solid marketing communications will be worth getting right. Local door-to-door mailshots, direct selling to caterers, chefs and restaurant managers will help generate a local audience. Online marketing and fulfilment by e-commerce mail order will give further reach. Share your techniques and specialist research resources by starting up a Facebook group, subscribing users of your products who have a practical interest to try food smoking for themselves. This is a growing list of smallholding business ideas, which we hope to add to as we field further viable and 'mention worthy' suggestions. ...drafting a professionally formatted business plan may well help you define and establish clarity for a more successful approach to running a profitable smallholding business. Using a format developed by experienced & professional business consultants can get you off to a flying start. ...managing a business diligently requires meticulous attention to detail and keeping of records. Having to hand pre-drafted, intuitively designed business management templates using commonly available software packages such as Microsoft Excel can save much time and hassle in devising your own system. ...websites which are easy to use, for both visitors and administrators of all IT proficiency are very valuable assets. Even more so if they are well resourced with marketing collateral from their owner and furthermore, search engine optimsed for visibility with targeted customer and stakeholder audiences. Custom website themes, fit for purpose, ticking all the boxes and ongoing remote, web support services are a solid investment for smallholdings owners conscious of ROI. ...engaging your customers and other audiences via social media channels is a highly effective way to remain in conversation with the various segmented stakeholder groups associated with your smallholdings business. Keep adding value to them, consistently, by serving highly relevant problem solvers and answer to their most pressing questions. ...make it easy for your customers to pay for products and services online, offering all necessary collateral for dealing with the most to the least common investment objections. Consider the user experience and information architecture for optimising the rate of sales conversion. Are you seeking a little extra help one-to-one in planning your smallholding business? Take us up on our offer of a free marketing assessment.